Pre-production is just as important as filming or editing a wedding film. Many filmmakers seem to skip over this crucial part. We reach out to our wedding clients before their event to cover the final planning and story elements. This ensures that we can do the best job possible for them. Here is what we cover during this call. 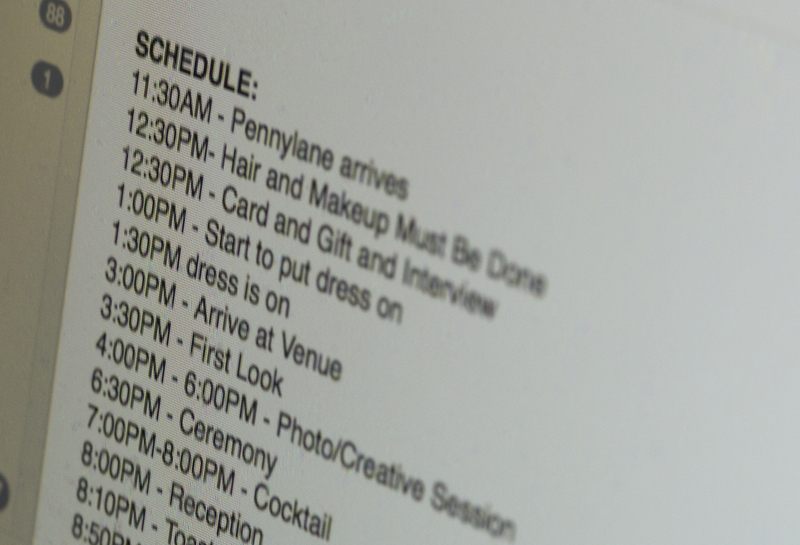 Having a solid schedule is the only way you can ensure the best product for your wedding clients. It’s pretty simple, you just let the client know how much time you need to do your thing. Remind them to combine the time needed from their photographer as well. Add it up and factor it into the master schedule. If there is a planner, involve them too of course. 15 minutes for creative session time. This is when we direct the bride and groom for creative sequences. Never assume you’ll have enough time to do your thing unless you plan ahead with your client. I will just come out and say it……Hair and makeup always run late. Ok if you’re a hair stylist or makeup artist and you always finish at the time you promise, then you are a rare breed. It’s important to factor this phenomenon into your schedule. Our fix for this is to tell the bride to lie to her hair stylist and makeup artist by pushing the end time by 30 minutes. When they run late (usually on average 30 minutes), then you’re back on schedule. No stress for anyone. Available light is my best friend during bride and groom preparations. We do not bring assistants with us during preparations. Because of this, we rely on available light during this part of the day. The larger the source of light, the softer the light and we love soft, so large windows are always in high demand. During pre-production, I encourage the bride to have her makeup artist setup up about 90 degrees in front of the largest window. I also let her know that interior lights mixed with exterior light will ruin skin tone on camera. Turning off lights during preps is a common practice for us. Our clients are encouraged to let everyone know. Sometimes the makeup artist insists on using interior lighting. We have a plan B for this by asking them to save the last 10% of makeup for touchups in available light. They are always cool with that. When the bride and groom exchange their cards and/or gifts I explain that it’s a great moment. It always pays off to do a little preparing for this. It takes a few minutes to find the right area, with the right light. Another factor is noise. I always look for a separate room and remind everyone in the room to keep it down to a whisper during the moment. This process averages about 10-15 minutes. I highlight this during the pre-production phone call. Just like the cards/gifts sequence, we also let the client know that lighting and audio is important during the interview. They are also made aware that the interview will be about 10-15 minutes and requires a quiet area or room. Usually card/gifts and interviews are filmed back-to-back to keep everything flowing. I find that barely anyone factors in a realistic amount of time for the dress going on. The bride usually has to go into a room privately to get “PG” first. Next the photographer and I are let in to begin capturing images. The dress is zipped, button, or tied. The shoes need to go on, jewelry needs to go on, things sometimes get delayed, tweaks, etc. In the end, this process is always a 30 minute deal so we let them know to factor it into the schedule. I don’t care what anyone says, if you want a great first look moment, you need to pre-production. Put simply, you need to prepare a game plan with the photographer. Collaborating with a photographer on this is important to me. I always suggest 30 minutes to scout, plan angles, plan lighting, plan blocking, position everyone, and let it happen. My goal is that both the photographer and I capture great moments. This needs to be respected on both sides. Fortunately many photographers that I work with understand. Just like photographers need their control time to do their thing during a photo session, we require 15 minutes to get our magic as well. We encourage collaboration with photographers. Most photographers agree just the same. They direct their thing and we direct our thing. The 15 minutes we’re talking about is during the bride/groom part only. We just shoot journalist during the bridal party and family sessions. We ask the client how long they plan on dancing the first dance. If its short, we encourage them to extend it to at least 2 minutes. We’re looking to extract gold nuggets. This is a small fraction of the entire raw first dance footage. Another thing to bring up is if the MC will be inviting people on to the dance floor and when. 2 minutes is our golden number. Knowing this in advance helps greatly. Preparing for audio during ceremony is important to discuss with the client. During the pre-production phone call, we explain that we have to speak with a sound engineer/tech person who knows the audio system. We explain that we will need to know what connections are available for us to tie into for the system. We will attempt to split the audio so we can guarantee a clean feed. This is explained more in detail. Last we need to put lavaliere mics on the groom and officiant. We’re always capturing from many sources of audio to have options in post. The speeches are one of the narrative skeletons to the entire feature film. It’s important for the speeches to look and sound great. We explain that we will need to speak with that sound engineer. We always attempt to split the audio and use our wireless mic. This is the only way we can ensure perfect audio for both the film and live. We also let the client know that we will be lighting the speech giver. This is a great time to ask if they are using a lighting designer. The client is usually happy to know that we are passionate about the art. They understand that we are experts in what we do and immediately trust us more. If there is any push back from the sound engineer, we will have to let the client know. Next we encourage a conference call to come up with a game plan that works for everyone. What looks good to the naked eye, doesn’t always come across well on film or in photos. I find that most lighting designers are not aware of this. For example, floral designs floating on people faces during dancing does not look good on film. Certain frequencies from LED lighting do not play well with video cameras. It’s important for the client to understand this. Once understood, can prepare with a game plan ahead of time by talking the lighting tech. This process is similar to how we work with audio techs as well. I can’t believe how uncommon this is. Most photographers I’ve talked to have told me they never get calls from videographers before the wedding. On the flip side, I don’t recall getting calls from photographers either. It amazes me that this is normal. Communication is key to all success. When we call the photographer, we ask them what we need to know in order for them to get great images. We ask what is important to them. This immediately encourages a mutual respect and we can share our wishes too. The goal is to work as a team for the client. Most photographers I work with now are friends so we already know the drill. When the client knows there is a strong respect between photographer and cinematographer, they are always happy. The same applies to planners. We always reach out and introduce ourselves to the planners as well. Its important that we share our requested timeline with them. They should know what we need to give the client the best experience. Once the planner knows we are on the same page, its one less thing for them to worry about. Pennylane is a wedding film studio based in New York and the winner of over 30 state and international creative excellence awards. The creative director Adam Forgione has been hired to direct and speak for Canon USA at numerous CES and NAB Shows as well as speaking at events all over the world for WPPI, Storytelling Unleashed, WEVA, Masters In Motion, InFocus, and more. 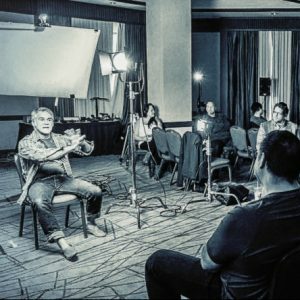 20 Replies to "Pre-Production Is Crucial For Wedding Filmmakers"
Thanks James. Ill never forgot you. The funniest interview I’ve ever done! Thank you for every other informative blog. The place else could I am getting that kind of information written in such a perfect method? I’ve a venture that I’m just now operating on, and I have been on the glance out for such information. Wow so much information and key factors I never even considered thanks for sharing. As always Adam – on top of your game. You are an asset to the industry! Mean a lot coming from you Dave. I feel the same way about you. Thank you very much, Adam, I had the privilege of seeing in BH Photo workshop with Jose Ortiz. Greetings from Tijuana, Mexico. you might be a legitimate good webmaster. The web site loading speed is incredible. It would appear that youre doing any unique trick. In addition, The contents are masterpiece. youve completed an admirable job on this topic! Had my share of Keyboard Kommandos lobbing cyber gernades at me of late…fock em’ Mostly fellow vets who have grown knee pads of love for “The One”….needless to say, they wouldn’t have the guts to do it in person….so it’s like water off a duck.Hey Fred! You and yours have a Great Thanksgiving tomorrow!